Twitter Admits Shadowbanning Lisa Page Tweet By Federalist Co-Founder "To Keep People Safe"
Twitter has admitted to shadowbanning a tweet by The Federalist co-founder Sean Davis in order to "keep people safe." 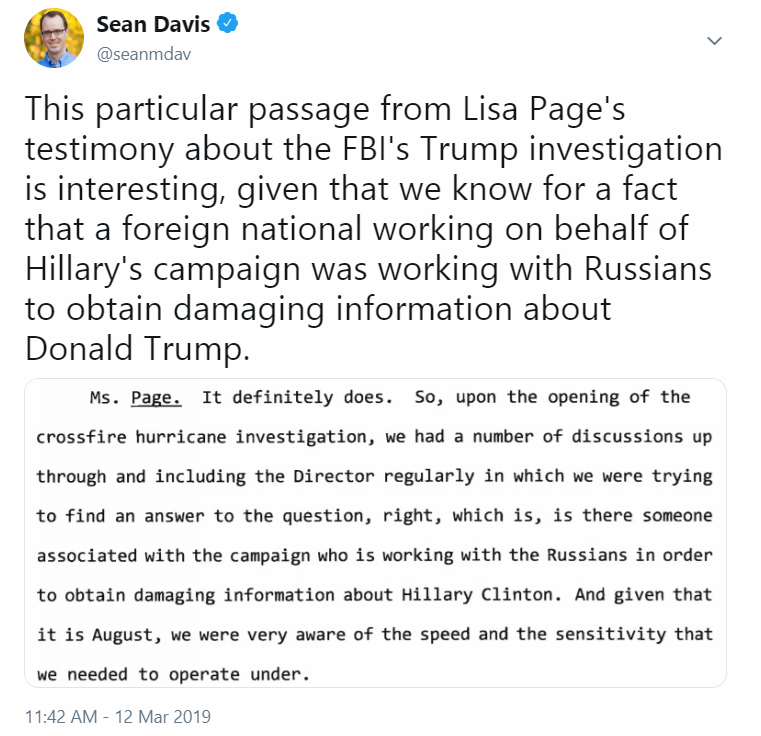 Tweeting a passage last week from former FBI attorney Lisa Page's Congressional testimony discussing the FBI's rush to find connections between the Trump campaign and Russia, Davis pointed out the irony of Hillary Clinton's campaign employing former UK spy Christopher Steele, a foreign national, "working with Russians to obtain damaging information about Donald Trump." Of note, the dossier Steele compiled which was subsequently used to obtain a warrant to spy on a Trump adviser (and later smear Trump) relied on a "senior Russian Foreign Ministry figure" and "a former top level intelligence officer still active in the Kremlin," according to Vanity Fair. Following his March 12 tweet, Davis wondered if Twitter was experimenting with "shadow bans" - as he could only see his tweet if he was logged in, meaning nobody else could see it. Six days later, Twitter confirmed with Davis that they had deliberately shadow-banned his tweet in order to "keep people safe." "Twitter gave me no notice or explanation when it shadowbanned one of my Tweets about Russian interference in our elections," wrote Davis, adding "But what's worse is how Twitter apparently gives its users the fraudulent impression that their tweets, which Twitter secretly bans, are still public." Twitter gave me no notice or explanation when it shadowbanned one of my Tweets about Russian interference in our elections. But what's worse is how Twitter apparently gives its users the fraudulent impression that their tweets, which Twitter secretly bans, are still public. In short, Twitter did not want the public to consider the irony of Hillary Clinton's campaign paying for a foreign national to collude with Russians against Donald Trump, while the FBI scrambled to prove the Trump campaign did. In other censorship news, ZeroHedge is now banned in New Zealand and much of Australia following our reporting on the Christchurch terror attacks. Sorry citizen, some facts are just too dangerous for your own good.